“Everything Was Beautiful, and Nothing Hurt” is a finely wrought example of Cole Case's delicate, terse style. The exhibition’s title is as poetic as the works themselves, taken from a drawing in Kurt Vonnegut’s book "Slaughterhouse 5." 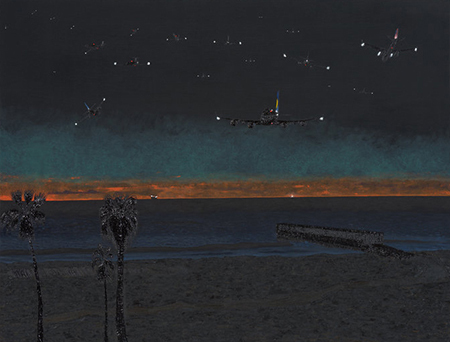 Working with landscapes that are primarily desolate, Case’s subjects include beaches, harbors, neighborhoods under flight paths, and seascapes that are barren except for an evocatively-placed palm, a lone freighter, towering airplanes. Eight evocative paintings are joined by a series of works on paper. Viewers see elements of realism and the surreal, a naturalistic style contrasting with a subject matter that is often hauntingly skewed. The ghost of Rousseau inhabits these works.